·Cou Clair - (coo clair) Literally "clear neck" - front quarters are tan, saffron, off-white, or shading to gray with black hindquarters. ·Cou Noir (coo nwah) literally "black neck" - Black front quarters and white hindquarters. ·Sundgau - (sundgow) black with white markings such as underbody, facial stripes, etc. ·Pied - spotted or mottled. ·Chamoisee - (shamwahzay) brown or bay - characteristic markings are black face, dorsal stripe, feet and legs and sometimes a martingale running over the withers and down to the chest. Spelling for male is chamoise. ·Two-tone Chamoisee - light front quarters with brown or grey hindquarters. This is not a cou blanc or cou clair as these terms are reserved for animals with black hindquarters. ·Broken Chamoisee - a solid chamoisee broken with another color by being banded or splashed, etc. 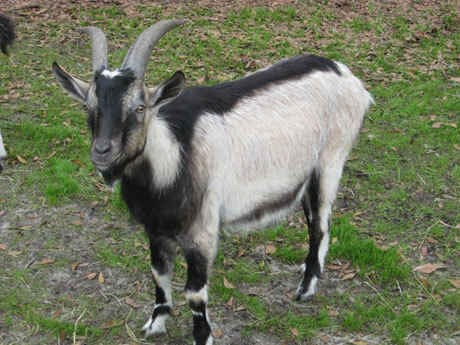 Alpine Goats are hardy, adaptable milk goats that thrive in almost any climate while maintaining good health and excellent production.